Every January people around the world make New Years resolutions and set themselves challenges. After officially going vegetarian in the latter half of 2018 I’ve decided that from 1 January 2019 I’m going to go vegan. Will I make it until the end of the month? Will I stay vegan for good? Who know’s. But for now, here’s a little bit about why I’ve decided to take on the challenge. Well there are actually a few good reasons to be vegan. I don’t want to sound like “one of those militant vegans” or get “preachy”, but I thought it was worth sharing why my blog and instagram feed are going to be meat, dairy and egg free over the next couple of weeks. Now I want to clarify one thing before I move on…I don’t actually believe that vegans are militant or preachy. I’ve only ever come across lovely supportive people who have made a lifestyle choice and don’t want to be berated for it. Veganuary has its own Facebook page and I’ve not experienced anything but encouragement and support from the group. Plus veganism isn’t quite as strict as you might think…if you’re thinking of taking part now or in the future I really recommend you join the group and get to know real vegans who just want to help and aren’t judgemental or pushy at all. I also found this article: “Why do people hate vegans? A behavioural scientist and food author explain” SO interesting. Well worth a read if you’re struggling with the backlash from choosing to go plant-based. By eating a plant based diet for 30 days I knew that I’d have to get a bit more creative. Although Jon and I already eat a vegetarian diet at home, we heavily rely on eggs and cheese so cutting these out (or at least finding palatable alternatives) was going to test us somewhat. I only “officially” went veggie back in October 2018. I’ve stuck the officially in quote marks because I actually think it may have been a bit before that that I actually ate my last piece of meat or fish. I’ve been very slowly weaning myself off meat since I went to university in 2009 and in the last year or so had really noticed how sick I felt after eating a large amount of meat – red meat in particular. Back in May I started a bit of a new healthy eating regime as I was trying to get back into shape. In doing so I naturally cut down my meat intake even more and was rarely touching the stuff by autumn of last year. I felt so much better for it. Much lighter and brighter. My skin has never looked better (minus the odd breakout around the wrong time of the month) and I’m a lot less bloated. I wanted to see if cutting out the dairy and eggs would only increase the health benefits I’d seen since really reducing my meat consumption. I’ve suspected for a long time that I’m probably lactose intolerant but put up with the side effects because dairy is yummy. Perhaps by the end of the month I’ll realise I need to cut it out once and for all? 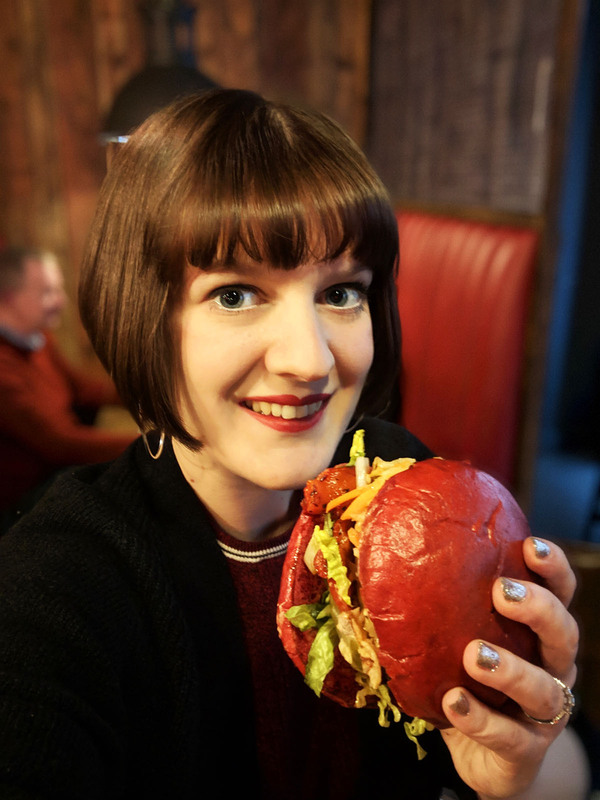 To prove how dedicated I am to eating healthily during Veganuary here’s a photo of me and a plant based cheese burger…oops! There have been tonnes of studies (from the UN and Oxford University) which have shown that being vegan is THE BEST way to reduce your environmental impact. If that isn’t a good enough reason to try going vegan I don’t know what is. By eating a plant based diet you can reduce greenhouse gas emissions, save water, protect nature and reduce pollution. You’ve probably already heard of it but, if you’re interested in finding out more about the environmental impact of the meat and dairy industries then watch Cowspiracy! As I’ve gotten older I’ve also gotten a lot softer. As a teenager I’d happily declare that I wasn’t hypocritical about eating meat because if I really had to, I could kill an animal and eat it for survival. After watching A LOT of episodes of “Bear Gryll’s: The Island”, and applying a few times…I’ve finally admitted that I don’t think I could. I’d much rather be veggie than have an animal suffer at my hands. All vegans do is extend that feeling about not wanting animals to suffer so that it covers chickens laying eggs, cows being milked and bees producing honey, amongst other things. I’m happy to support animal welfare in this way. So what has been the one thing holding me back in the past? Well the potential lack of variety has been one. But the biggest worry of all has been nutrition. Especially since I’ve upped my activity levels I’ve been worried that I’ll struggle to get a properly balanced diet with plenty of carbs, fat and of course protein if I’m cutting out meat, dairy and eggs. Since I’ve gone veggie I have massively relied on yogurt and eggs to make sure I’m getting enough protein so I will have to be careful to make sure I get my protein from other sources. I don’t for a minute think it’s impossible, I just think I will have to be more conscious about what I eat. What’s the plan after Veganuary? So there we have it, my reasons for going vegan. Some people opt for a plant based diet just for one reason alone but having done plenty of research I found them all pretty compelling. So much so I couldn’t choose just one. I’ve already been asked by lots of family and friends whether or not I expect to stay vegan at the end of the month. Going into this I didn’t want to make any promises. So whilst I am not planning on staying vegan that’s not to say I won’t change my mind. What I think is most likely is that I will cut out cow’s milk for good. If I can also find a good substitute for cream, crème fraiche and yogurt then I might not consume any dairy at all in the future. As for cheese and eggs… these two will be the hardest for me to give up forever. I think in all likelihood we will look to reduce these as far as possible reserving them for the odd treat. But we shall see…keep your eyes peeled for an update at the end of this month! Until then, I hope you enjoy following my journey and enjoy my recipes. Just remember, even if you aren’t following a plant-based diet you can still enjoy the tasty meals and treats I cook up over the following month. We could all do with eating a little more fruits and veggies whatever our situation!